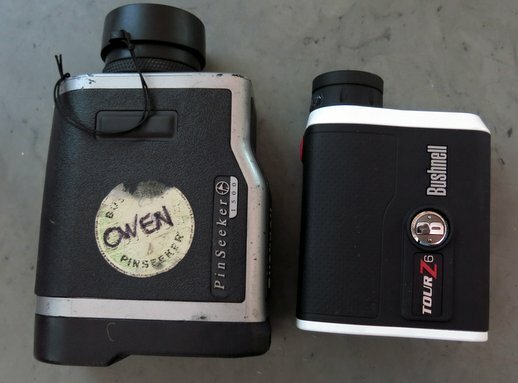 My ancient laser rangefinder, a Bushnell PinSeeker 1500 (above, left), finally stopped working. The low-battery warning began flashing and wouldn’t stop, even though I replaced the battery, twice, using fresh spares from my golf bag. 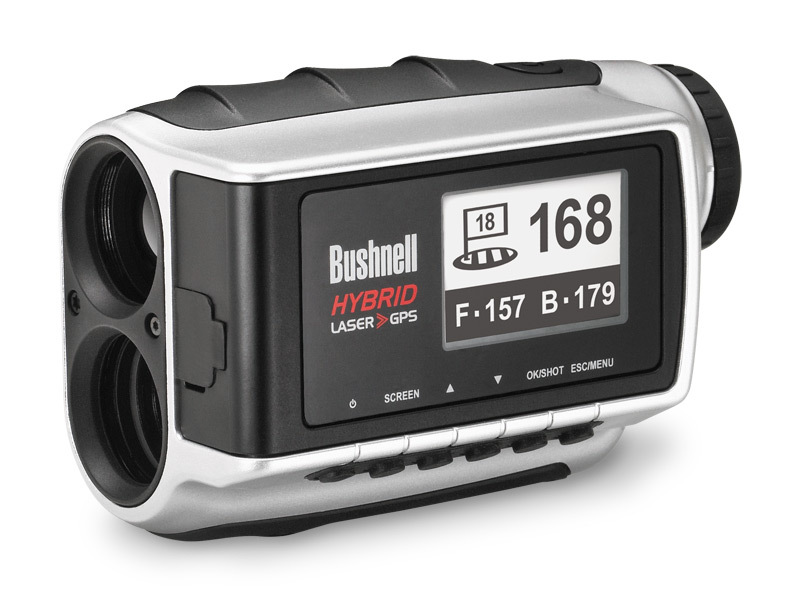 As soon as I got home, I ordered a new Bushnell Tour Z6 (above, right), for three hundred dollars. The Z6 is quite a bit smaller than the PinSeeker, and it weighs almost four ounces less—a potential advantage in competition. The day after the Z6 arrived, I was rummaging in my desk and came across an unopened package of the kind of batteries the PinSeeker used to use. Out of curiosity, I popped one in, and—what do you know?—it worked just fine. I guess that carrying two nine-volt batteries in your golf bag for more than a year isn’t a good idea, as far as the batteries are concerned. So I now have two perfectly functioning laser rangefinders, and I’ll thank you not to mention that to my wife. I used the Z6 for the first time on Friday, in a match at home. 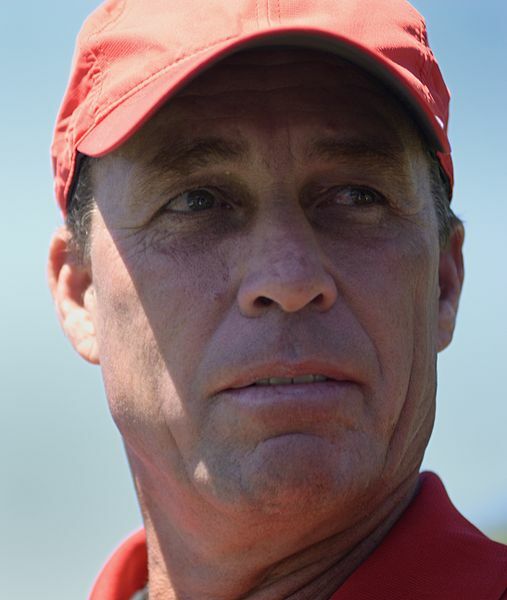 The match was Addison and me against Ray and our Close Personal Friend Ivan Lendl, who belongs to a couple of clubs in our area, including our Enemy Club. I won’t bore you with the details, except to say that I had a short birdie putt on the eighteenth hole to square the match, and missed it. But Addison had a slightly longer birdie putt to do the same thing and made it, so good for us. We’re all square for now, and we will play a rematch at a time and place to be determined. 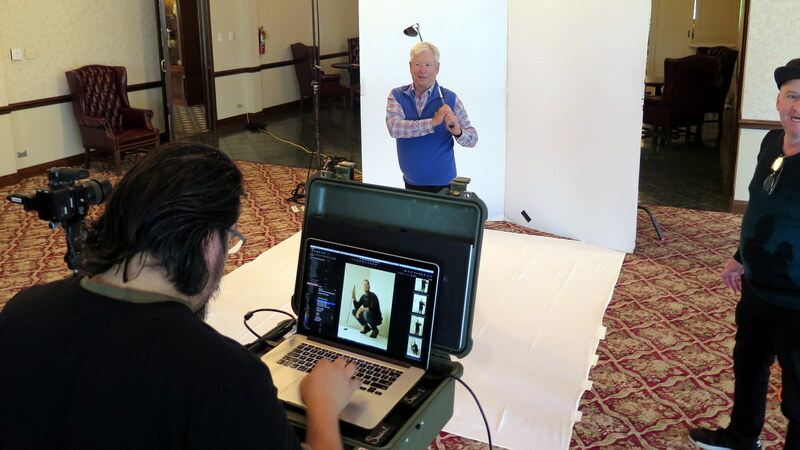 In the photo above, Ivan is using his own rangefinder, which is Bushnell’s “hybrid” model. It has a laser, like mine, but it also has a GPS unit, which is sort of grafted onto the side. I asked him whether he ever used the GPS part, and he said he didn’t because the GPS part (like all GPS yardage devices) is so power-hungry that if you use it you have to recharge it after every round. About thirty minutes after our match was over, Addison and I played again, in the Friday-afternoon edition of the Sunday Morning Group. During that round, several unusual things happened. 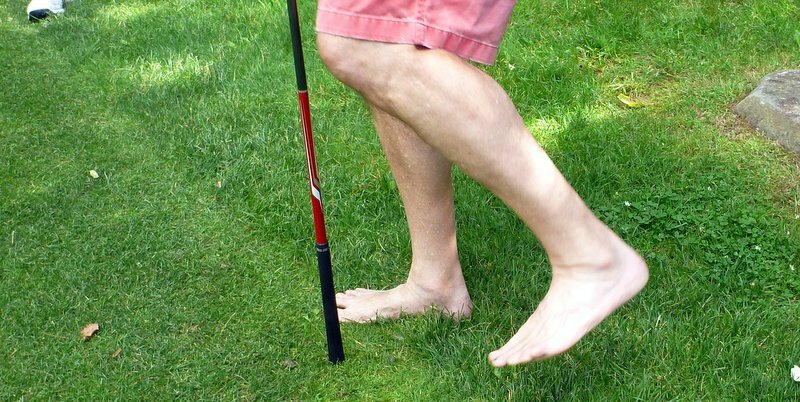 First, Other Gene joined us late and played without shoes or socks, giving the rest of us a close look at something you don’t see on a golf course every day: lawyer feet. 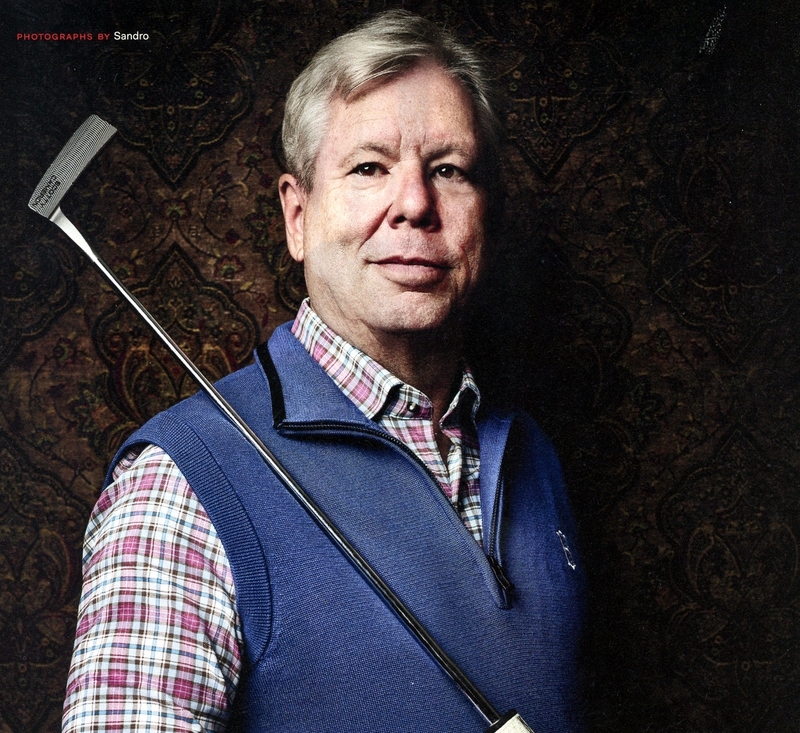 Third, on the third hole—a 185-yard par 3—David W. hit a gorgeous 4-iron shot, which landed on the green, rolled toward the flag, and disappeared. 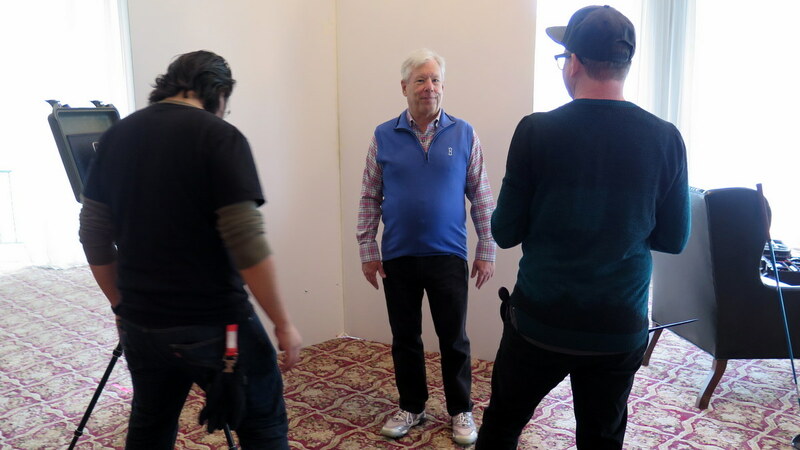 Nobody in our group, including David, could see well enough to be certain what had happened, but we had a feeling. Because this was an S.M.G.-sanctioned outing, David will receive $250 from the Slush Fund. (An non-Sunday-morning outing is considered sanctioned if an email inviting everyone to join goes out in advance over the S.M.G. Listserv.) If David had done the same thing on a Sunday morning, he’d have received twice as much. 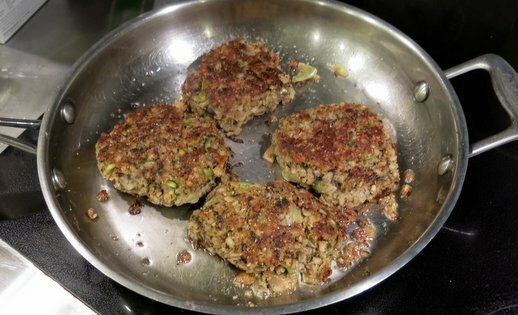 That evening, my wife, Ann Hodgman—who has written several cookbooks, and is currently writing one for strict vegetarians—made vegan burgers for dinner. They contained chick peas, barley, leeks, and other stuff. 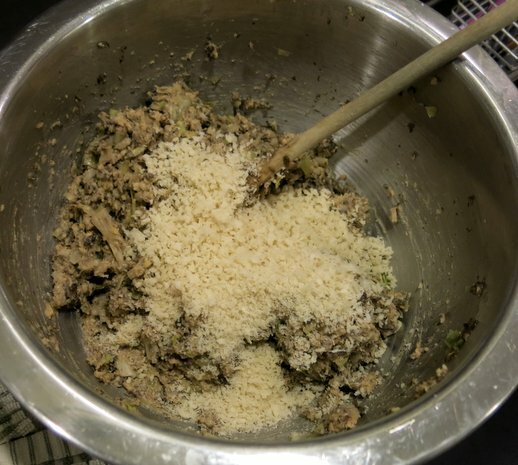 (That’s the mixture, in the photo above.) They didn’t taste like burgers made from beef, but I liked them. 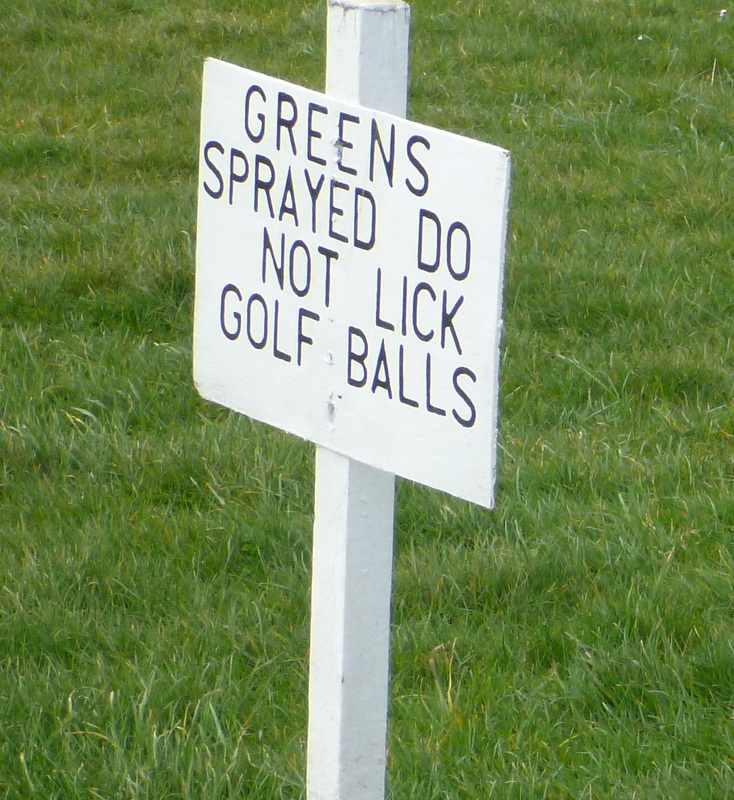 And when I got home from playing golf the next morning I ate two more of them, right out of the fridge. Now who’s a good husband? Ivan, Isabelle, Crash, and Marika Lendl, Bradenton, Florida, May, 2006. Photograph by Martin Shoeller. A week and a half ago, Isabelle Lendl, who is a senior at the University of Florida, won the women’s division of the Dixie Amateur, at Heron Bay Golf Club, in Coral Springs, Florida. She was five back after fifty-four holes, but shot 66 in the final round and won by four. Among those she beat was her younger sister Daniela, a sophomore at the University of Alabama, better known as Crash, who shot 67 and tied for sixteenth. It was Isabelle’s fourth win of the season. And she clearly will. I’ve played with her a couple of times since then, and she is not only terrifically talented (and nice!) 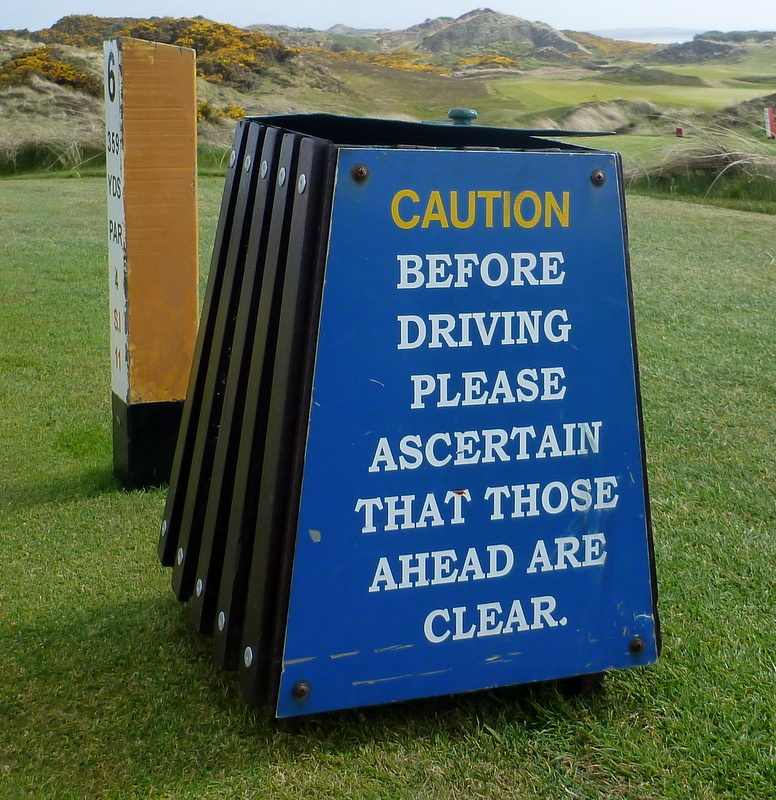 but also mentally well-equipped to play competitive golf. When she was in high school, her father—the former tennis star Ivan Lendl, who now coaches Andy Murray—thought that on a golf course she was sometimes too eager to take unnecessary risks, but she has managed to tame that without becoming any less imaginative or aggressive. 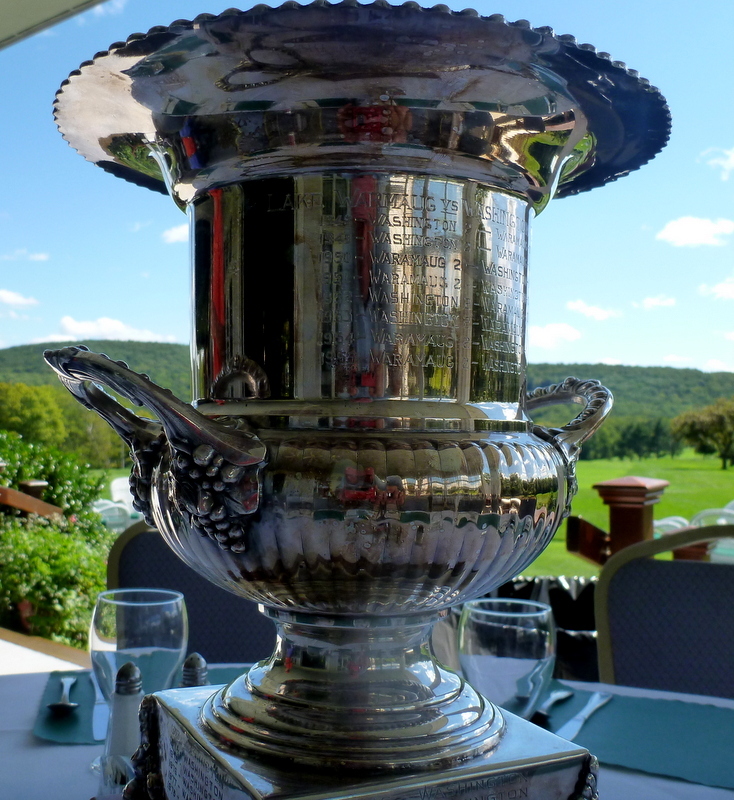 At the Dixie Amateur, playing with the young woman who had begun the day with a five-stroke lead, she birdied the first three holes, and, on the second nine, made three birdies in four holes exactly when she needed to. I wrote about the Lendls in The New Yorker in 2006. You can read that article here. Marika, Isabelle, Crash, and their coach, 2009. 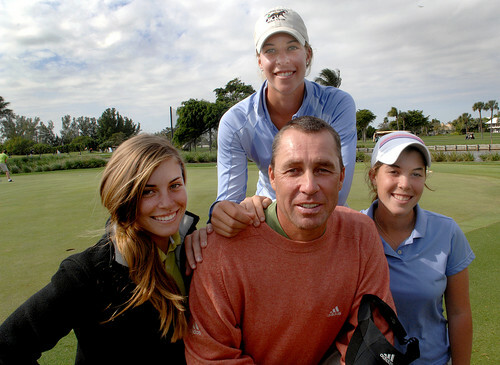 Lendl and his wife, Samantha, have five daughters, three of whom—Marika, Isabelle, and Daniela, who has been known as Crash since she was a little girl—are terrific golfers. Marika graduated from the University of Florida last year; Isabelle is a senior at Florida this year; and Crash plays for the University of Alabama. 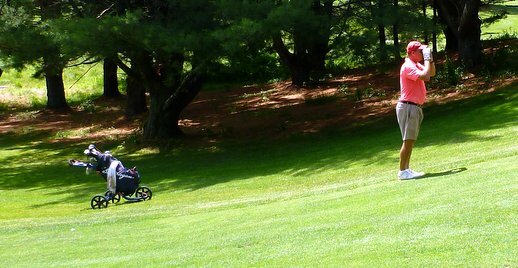 Isabelle qualified for match play in the 2004 U.S. Women’s Amateur, when she was thirteen. I first saw her play two or three years before that, when she was already proficient at a shot I’ve never seen an adult amateur pull off: a low, short chip that bounced once or twice on a firm green sloping away from her, then spun to a stop right next to the hole. In Florida once, Isabelle was hitting balls on a driving range while a pro watched her. After she had methodically worked her way through one large basket of balls, she moved to the next station, kicked over the basket sitting next to it, to spill out the balls, and went to work on those. The part of her game that impressed the pro the most, he told me, was the kick: she had clearly done this many times before. When Crash was eight, she told her father that she wanted to play ice hockey, and he let her stay up late one night to watch a televised women’s game, in the Olympics. Early in the first period, two players were pressed against the boards, trying to control the puck, and Crash asked, “Why didn’t she just smash her into the glass?” Ivan said, “There’s no checking in women’s hockey,” and Crash said, “You’re kidding.” She watched for a few more minutes, then, disgusted, went up to bed. I wrote about the Lendl girls here, in 2006.